Is There Still A North/South Divide? Posted on 6th March 2011 at 14:40. In case you haven’t already noticed, or have been in deep hibernation, we’re in the midst of a recession. Rising unemployment, public sector spending cuts and yet another predicted quarterly negative growth forecast, only tends to add to the general feelings of despondency and gloom. However, figures recently published by Forrester Research would suggest that it’s possibly not as bad as we’ve been led to believe. The continued growth of internet marketing and the consequent rise in on-line sales would appear to suggest that it isn’t necessarily that grim up north. In spite of recessionary pressures, on-line European sales grew by 18% in the financial year 2009-10, and Forrester are forecasting that this growth will continue throughout 2011, albeit at a reduced rate of 13%. On-line sales are predicted to total 92 billion Euros. Additionally this research indicates that on-line buyers will increase from 157 million to 205 million during the course of the next five years. The average European on-line shopper spent 517 Euros last year, mainly on electrical goods and computers, with books, clothes and event tickets following closely behind. 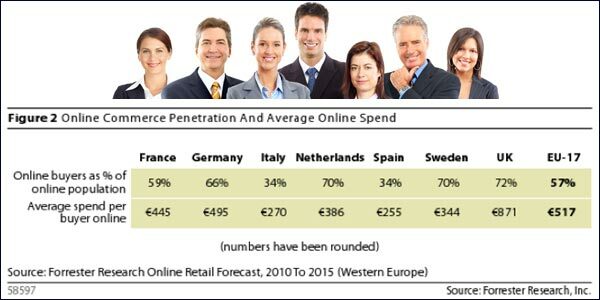 The British appear to have bought into the idea of e-commerce with more enthusiasm than any other nation, spending on average 871 Euros each during 2010: Spaniards on the other hand spend the least, averaging only 255 Euros each. Unfortunately this rapid rate of on-line growth has come at the expense of traditional retail sales. What is perhaps of most interest is the insight these figures give about consumer spending patterns. The research clearly demonstrates that there is undoubtedly a clear north/south divide in the e-commerce market, with Northern Europe leading the way in on-line spending, particularly the UK. Why that should be the case is unclear, however, it’s arguable that it’s simply a reflection of lifestyles, habits and preferences. British consumers have wholeheartedly embraced the e-commerce culture, and appreciate the competitive pricing, expanded product choice and convenience of on-line shopping. The rest of our Southern European neighbours, though warming to the idea of e-commerce, appear to prefer the more-rounded, traditional, retail shopping experience, where on-line shopping is just an adjunct. Is The Internet Really That Big?Facebook Is Still The Social Media Of Choice For Small Businesses.